While I appreciate music in many genres, I’ve always had a love for electronica… especially ambient, chillout and IDM due to artistic influences in my youth (see “Influences” page). 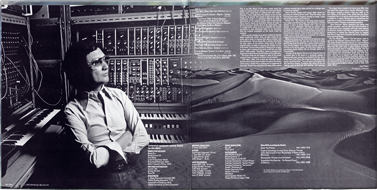 It all started around age 6 when I first heard works done by a Japanese synthesist/composer named Isao Tomita. My parents had bought 3 of his records (Kosmos, The Planets, and The Bermuda Triangle) at a garage sale because the cover artwork “looked cool”. Little did I know (at the time) that he was a major pioneer in the electronic & analogue synth music scene. When listening to his material, I often dream of soundscapes, distant planets and other such far-away places, and I think my early exposure to his music influenced me for the rest of my life towards a “space ambient” style. Over the years my interest and love for electronic music grew until the point of finally acquiring various synths over the past decade, and have developed a voracious appetite for all things synth and ambient. When it comes to my music and synth demos, I try to showcase various features of the synths in an ambient style, and to share with others my love for these synths. My music is often considered “space ambient” comprised of long sustained pads, arpeggiators, resonance, reverbs and delay. I find this style allows me great freedom to tweak a synth’s various parameters, play with effects to create new sounds, and create emotional soundscapes that are pleasing to my ear and which take me (and hopefully, the listener) on an emotional journey through electronic music. My albums are available online on Google Play, iTunes, Amazon, Bandcamp and various other digital music distribution sites. I’ve always had an interest in electronic music (particularly ambient, chillout, IDM [intelligent dance music] and space music) since a young age, which eventually developed into a deep interest in hardware synths and subtractive synthesis in general. My two biggest artistic influences towards the hardware synthesis and ambient music path are Tomitaand Autechre. Through school and self-learning, I also have some background in electronic and electro-acoustic music composition which further propelled me to explore sound creation/manipulation devices and ultimately, subtractive synthesis and synths which would allow for new musical creation. It all started with my introduction to classical synthesizer-based music at around age 6, when my parents bought a record at a garage sale called “Kosmos” by Japanese synthesist/composer Isao Tomita, which I would listen to endlessly as a child. For those unaware, Tomita is world renowned for re-creating classical music pieces (ie Holst, Stravinsky, Wagner etc) using hardware synthesizers and effects, particularly in the early 70s and 80s using only analog technology — the results of which are amazing considering the technological limitations of that time.For me, his work is a form of sonic art that begs to be listened to with headphones lying down with the lights off… I find his music often transports me to other galaxies and solar systems, if you know what I mean. 🙂 Tomita’s “Kosmos” album (listen to some tracks here and marvel at the cover artwork here) and his others such as “The Planets” and “The Bermuda Triangle” therefore set me on a path from an early age towards instrumental ambient space music, with a particular fondness for hardware synthesizers.Looking at the inside of the Kosmos record album liner as a kid, I would gaze endlessly at the photo and list of hardware modules, Moogs, Polymoogs, Roland System 700, sequencers and other technologies he used on the album, which I think planted a seed in me to blossom towards obtaining hardware synthesizers later in my life.In short, Tomita is basically my idol in the hardware synth/space music/ambient genre from which all my other sonic explorations and synth influences sprung from over time. Note: I’m copying this content from my site at http://synth4ever.com/about-synthever/influences as it says everything about their influence on me.In the mid 90s, I was exposed to Autechre and the musical genre of IDM (intelligent dance music), and my life changed once again. I first heard a sample of the track “Bike” from their debut album “Incunabula” and was instantly hooked. Something about the simple melody, beats, and soft sounding synth lines just grabbed my ear and wouldn’t let go. I bought the album and listened to it straight through.While there were some good tracks on Incunabula, it wasn’t until Autechre’s 2nd album, “Amber” that I became a true fan. This album is one of my favorite ambient/IDM albums of all time. Track 4 (“Slip”) and Track 9 (“Yulquen“) especially just took me places, and from thereon in I was hooked for good. Their 3rd album, Tri Repetae, was equally amazing in a slightly more industrial-sounding fashion, with tracks like “Clipper” and “Eutow” being particular highlights.Anyway, Autechre has since gone on to do many more albums, some of which are completely abstract, and others which approach the musicality of their earlier efforts. They are masters of synths, beats, samplers and other gear, both hardware and software, and their creativity knows no bounds.Listening to Autechre’s music influenced me towards wanting to learn more about HOW the sounds they used were created (ie, synthesis), HOW and WHY they used effects and sequences to build atmosphere, how seemingly disjointed abstract pieces could come together in a cohesive manner… basically I found their creative process incredibly inspiring as they are so adept at leveraging traditional subtractive synthesis and other techniques (ie granular synthesis, MaxMSP etc) to the point that I wanted to create similar music as they did, someday (even though I currently do not use rhythm in my music, I can foresee a time where I may gravitate towards a more IDM/beat-based ambient style on some future albums). Hence their use of hardware, software and other techniques further led me on a path towards getting into subtractive synthesis. I will add that on the music composition side, I won awards for electronic music composition in high school for musical pieces I composed on a Roland JV-30 hardware synth and Atari ST (for sequencing). High school was probably one of the first times I had exposure to using a synth in my youth (albeit a ROMpler), and I really enjoyed composing music and tweaking the synth’s various filters and envelope settings to get the sounds I wanted. Although it was limited, it fed a hunger in me to create and control sound in a way I found emotionally and acoustically satisfying.I also took a number of electro-acoustic music composition courses (manipulating recorded sounds to create soundscapes via hardware and software filtering, time stretching etc) throughout my university years in the early 2000s. One of my electro-acoustic compositions tied for 5th place at an international electro-acoustic music competition, for which I was commissioned to do another peice with was broadcast on Canadian radio and performed live at various electro-acoustic/ambient events in my city.Through the electro-acoustic music side of things, I had an opportunity to experiment with sound itself as music, learning about the properties of sound, the importance of the acoustic environment and other factors as they relate to sonic composition and by extension, subtractive synthesis in the future. Over the years I’ve collected a ton of ambient, chillout and IDM music and discovered many underground artists in the process via archive.org and various netlabels such as the now defunct Monotonik netlabel. Some of these other artists I have listed as influences on my website here: http://synth4ever.com/about-syntheverListening to others’ ambient musical compositions further inspired me towards wanting to make similar music, and hence eventually towards learning subtractive synthesis using hardware synths. I took piano lessons for a brief time when I was young, but eventually ended up playing the drums from age 12. I’ve played drums in various cover bands and original projects in my city for 20 years now… mostly funk, rock, blues and progressive rock.In 2012, I decided that as much as I enjoy playing drums (and still do) and supporting other musicians in a band setting, I wanted to try some musical endeavors for myself that didn’t rely on any external influences or 3rd parties. So a number of years ago, I decided I was going to get serious about learning subtractive synthesis and finally take my first REAL step at acquiring a hardware synthesizer — and my passion continued from there. Feel free to drop me a line to say hello, or connect on the various social media sites such as Facebook, SoundCloud, Twitter and Youtube.